I have personally become a major fan of the Pocket Informant from WebIS developed for the iPhone. This application has been able to bring together two very important tools, the calendar and the To-Do list. This makes your life much more easy and organized. This application is very young still though and thus the management of it does not have as many features as Appigo’s To Do application for ipod touch or iphone. This is the reason that many people prefer using Appigo’s ToDo. Appigo’s ToDo application is a veteran when it comes to these types of iPhone applications. 1 of the coolest things about this application is that the number of updates which it has seen has been regular and meaningful. It is pretty expensive at $9.99 but it’s flexibility and power make it well worth that price tag. In the words of the company itself ToDo iPhone App is a very powerful tool that manages to make task management very simple & fun. You can use it on its own or you can synchronize it with your online tasks or even with your computer. This application helps you to focus on things that matter the most and lets you integrate GTD methodology or develop your own. You can make more than one list. You can make use of the “all list” function or you can focus on the tasks which are the most important by viewing the “focus” list. 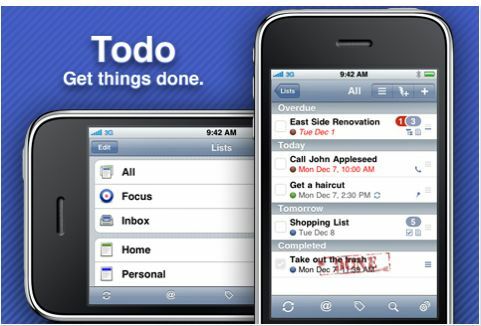 This To Do iPhone application helps you work with efficiency and evenly spread your workload with others. You can save time by using quick add. You can share your notes through email and even import tasks directly from others. There is no shortage of things you can do with this application and even though it is expensive, you would definitely want to have it for your iPhone. Get this To Do iPhone App Here.